One last post from today! 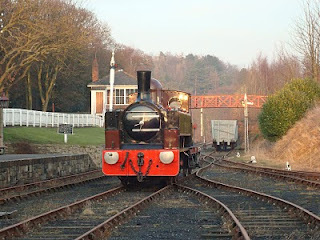 Below: A No.5 catches the evening sun prior to being shunted away for the night. Below: The concrete foundations revealed, to be cleaned up and reused with modifications. Below: The special transition rails, where the Ri60 tramway rail meets the flat bottomed rail of the reserved track sections. This area will sit on a concrete raft to spread the loadings throughout the transition.